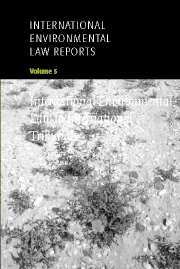 The first ever compendium of the key international and national decisions relating to international environmental law, this five-volume set is a valuable resource for all those interested in this growing field. Students, practitioners, NGOs and government agencies alike will be grateful to find, at last, the relevant case law easily accessible in one collection. The collection encompasses decisions from the late nineteenth century to the present day, and is presented in five themed volumes: Early Decisions, Trade and Environment, Rights and Environment, Decision of National Courts, and The International Court of Justice. Each case is accompanied by a full introductory note and, where appropriate, relevant background materials to facilitate a fuller understanding of the case. The volumes are comprehensively indexed.